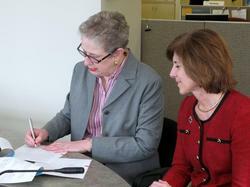 On Thursday, March 25 ARRL President Kay Craigie, N3KN, signed a new Memorandum of Understanding (MoU) with the American Red Cross (ARC) at ARC National Headquarters in Washington, DC. The MoU, which replaces an earlier Statement of Understanding that expired in 2007, provides a "broad framework for cooperation" between the ARRL and the ARC "in preparing for and responding to disaster relief situations at all levels in rendering assistance and service to victims of disaster, as well as other services for which cooperation may be mutually beneficial." Read more here. On Sunday, March 28 -- a day with a lot of rain, wind, sleet and, fog -- John Oakberg, NK4N, of Sevierville, Tennessee, went out hiking in the Great Smoky Mountains National Park near Mt LeConte. When he was about 1 mile up from Alum Cave Bluff, he came across Judy Potter, 57, of Atlanta who had broken her ankle while on the trail. Oakberg reached for his cell phone to call 911, but there was no coverage available. He then reached for his handheld transceiver and put out a call to any Amateur Radio operators who may be listening via some nearby VHF 2 meter repeaters. Read more here. According to ARRL Chief Operating Officer, Harold Kramer, WJ1B, we are currently finishing the final pre-launch adjustments and testing the new ARRL Web site and plan to launch it by April 12. "This launch has been a longer than anticipated process for all of us," Kramer said, "but we have learned a lot during the past two years as we conducted research about what people want from the ARRL Web site. We created a new architecture and navigation scheme to meet those needs and we implemented a contemporary new design. After that, we updated our current Web content and created lots of brand new content, including multimedia. We then began integrating the incredibly complicated functionality, e-commerce, advertising and database connections from the current Web to the new Web site. It has been a lot of work, and while it is disappointing that we are not out the door quite yet, we are now in the home stretch. When the new ARRL Web site debuts, we just want to be sure that it looks great, works well in meeting the needs of our members and that it is something that we can all be proud of." More than 20 educators and five Elmers participated in the first Teachers Institute on Wireless Technology, held over five Saturdays in February and March at Jefferson Park School in Tucson, Arizona. The ARRL Teachers Institute on Wireless Technology (TI) began its 2010 sessions in February with a TI course designed specifically for teachers in the Tucson (Arizona) Unified School District (TUSD). Taught at Jefferson Park Elementary School, 21 educators -- including the school principal, school counselor and three resource personnel -- took part in five Saturday sessions, working through an expanded 45 hour Teachers Institute (TIs usually are done in about 32 hours). The teachers completed homework assignments that included building the clock kit, building a flashing LED Santa and reading the first two chapters of What's a Microcontroller? 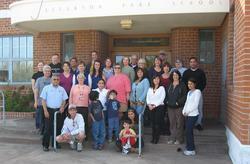 In addition, five parents attended the TI as observers. The course was taught by TI Instructor Miguel Enriquez, KD7RPP, who teaches in the TUSD. Read more here. This feature -- including convenient Web links to useful information -- is a concise monthly update of some of the things ARRL is doing on behalf of its members, including signing a new Memorandum of Understanding with the American Red Cross, preparing for WRC-12, legislative actions, holding workshops to help teachers introduce wireless technology in their classrooms, promoting on-the-air events, investigating power line noise and more. This installment covers the month of March. Read more here. One of the major items on the IARU Region 2 conference in El Salvador will be the discussion of a new HF band plan for the region. The International Amateur Radio Region 2 conference -- to be held later this year in El Salvador -- brings together delegations from the national Amateur Radio Societies in the Western Hemisphere. One of the topics on the agenda will be the Region 2 HF band plan. This band plan is "harmonized with" -- spectrum management-speak for "very similar to" -- the IARU Region 1 and Region 3 band plans. At this year's conference, the IARU Member-Societies will consider possible changes to the Region 2 band plan. The ARRL is cooperating with this procedure by inviting input to be sent to the ARRL Board of Directors' Band Planning Committee. The committee will review the existing Region 2 band plan, consider input from the amateur community and make recommendations to the ARRL Board for submission to IARU Region 2. Be sure to get your comments in by Monday, April 5. Read more here. The Sun, as seen on Thursday, April 1, 2010 from NASA's SOHO Extreme Ultraviolet Imaging Telescope. This MDI (Michelson Doppler Imager) image was taken in the continuum near the Ni I 6768 Angstrom line. 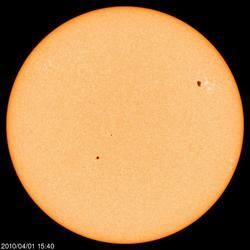 The most prominent features are the sunspots. This is very much how the Sun looks in the visible range of the spectrum. Tad "The uncertain glory of an April day, which now shows all the beauty of the Sun" Cook, K7RA, reports: Last week's bulletin said new sunspot group 1057 appeared March 23, but it was actually short-lived group 1056 according to summaries. Group 1057 emerged on March 24, and on March 25 1056 became a plage without spots. Sunspot group 1058 arrived March 26, but was gone two days later when 1059 emerged. Group 1059 has not become as large as 1057. From March 28-April 1, the size in millionths of the Sun's surface was 120, 100, 150, 130 and 70. But the size of 1057 from March 24-April 1 was 5, 240, 400, 320, 380, 410, 290, 260 and 250. Group 1059 is surely fading, but 1057 may be holding steady, even though it is down from peaks of 400 and 410 on March 26 and 29. The average daily sunspot numbers for the week were up more than 4 points to 28.9, and the average daily solar flux changed from 84.2 to 84.9. The renewed sunspot activity seems constant and steady. We have new 3-month moving averages of daily sunspot numbers through the end of March, which is centered on February, and the number has increased a few points from last time. The 3-month moving average of daily sunspot numbers centered on July 2009-February 2010 was 4, 4, 4.6, 7.1, 10.2, 15.2, 22.4 and 25.7. The rate of increase has slackened, but it steadily moves higher. Look for more information on the ARRL Web site on Friday, April 2, where Tad will have a bit more about the numbers, a visit to NWRA -- the home of the Effective Sunspot Numbers -- and reports on recent conditions. For more information concerning radio propagation, visit the ARRL Technical Information Service Propagation page. This week's "Tad Cookism" brought to you by William Shakespeare's Two Gentlemen of Verona (Act I, Scene 3). This week, the Lighthouse Spring Lites QSO Party is April 1-11. The QRP ARCI Spring QSO Party, the SP DX Contest and the EA RTTY Contest are April 3-4. The Missouri QSO Party is April 3-5 and the Low Power Spring Sprint is April 5. Next week, look for the Montana QSO Party on April 9-11. The Japan International DX Contest, the QCWA Spring QSO and the Georgia QSO Party are April 10-11. All dates, unless otherwise stated, are UTC. See the ARRL Contest Branch page, the ARRL Contest Update and the WA7BNM Contest Calendar for more info. Looking for a Special Event station? Be sure to check out the ARRL Special Event Station Web page. The winner of the QST Cover Plaque Award for March is Rudy Severns, N6LF, for his article "An Experimental Look at Ground Systems for HF Verticals." Congratulations Rudy! The winner of the QST Cover Plaque award -- given to the author or authors of the best article in each issue -- is determined by a vote of ARRL members on the QST Cover Plaque Poll Web page. Cast a ballot for your favorite article in the April issue by Friday, April 30. Registration remains open through Sunday, April 25, 2010, for these online course sessions beginning on Friday, May 7, 2010: Amateur Radio Emergency Communications Level 1; Antenna Modeling; Radio Frequency Interference; Antenna Design and Construction; Propagation; Analog Electronics, and Digital Electronics. To learn more, visit the CEP Course Listing page or contact the Continuing Education Program Coordinator.